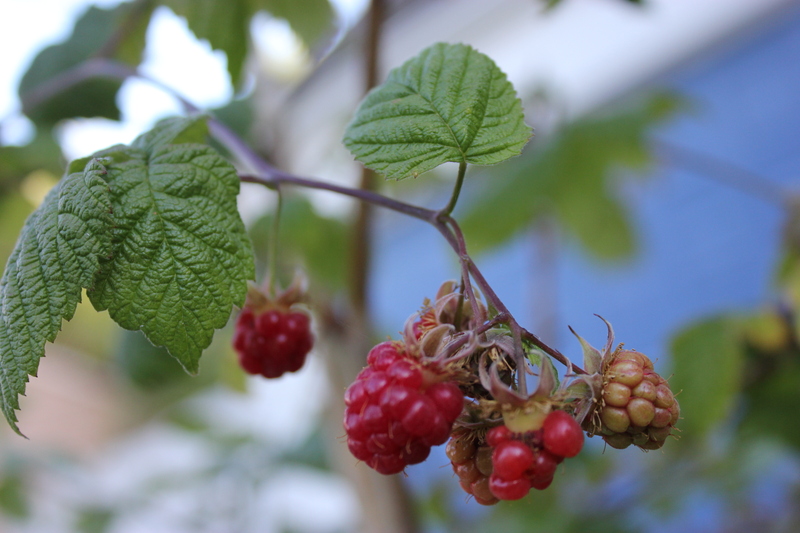 The puny and neglected, poorly transplanted, yet still delicious heirloom raspberries in front of our house. Nothing compared to the fat, luscious, melt-in-your-mouth orbs thriving at Rainshine Family Farm, perhaps the best kept secret in Corvallis. Why is it that you’ll only truly appreciate a place, deeply fall in love with it, when you’re about to leave it? For the past month, I’ve had these daily moments of reverence for Corvallis, and Oregon in general, I know I wouldn’t linger upon if we weren’t moving. At the Gathering Together Farm restaurant (our favorite place to eat around town), the Corvallis Farmer’s Market, at our food co-op (okay, we’re a bit food-centric here), our richly-sourced Asian market, in yoga and Zumba and WaterBabies classes, and at the radio station, I find myself already missing what I haven’t yet left. But we can’t look back. 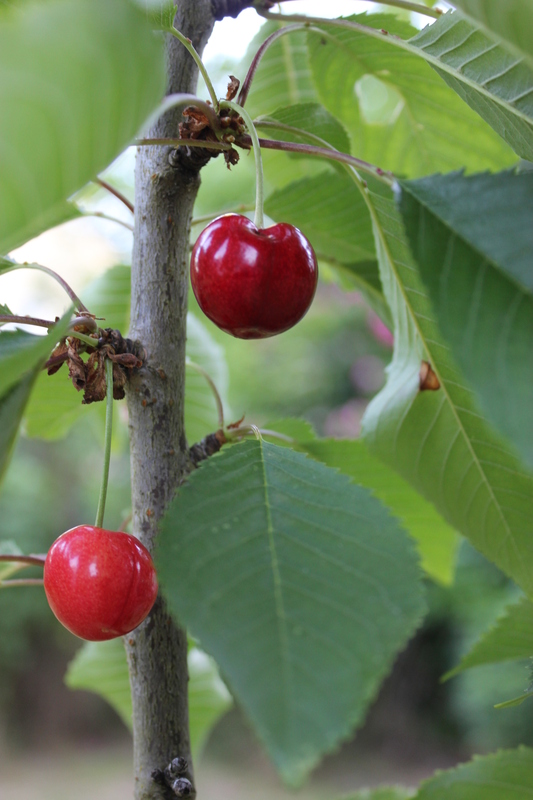 How I’ll miss Oregon’s sweet cherries, including these paltry few on the tree planted in our backyard. How I’ll miss all the berries, pears, apples and even persimmons that thrive in this Eden. We’re moving to Maine in mid-August. And it’s finally starting to feel right. My family convened on Great Pond in Belgrade Lakes about every other summer, but I’ve never been to Maine in winter. Ice-fishing, here we come. My parents are semi-retiring there; both Dan and I have lots of family around New England. We’re tired of day-long cross-country flights. We want to put down roots and stay put during summer. The trouble is, in four short years, we’ve become much more rooted here than we ever imagined. So it felt reassuring to discover the things I love here are connected to Maine. Maine indirectly kept asserting itself on a tour of a magical 2.5-acre urban farm today. This farm I’m just now stumbling upon is surely the best-kept secret (perhaps intentionally so) in Corvallis. 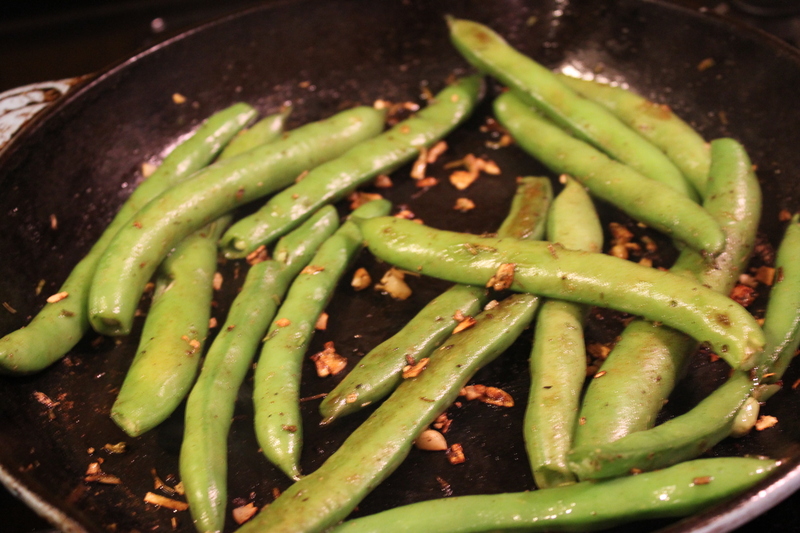 Sadly forgot to plant favas this year. They are so easy to grow and, as a cover crop, naturally fix nitrogen in the soil. And it’s surprisingly delicious to eat the whole grilled or roasted pod. And what do these Greenhorns use to sprout their starts? None other than Maine organic pioneer Eliot Coleman‘s seed-starting mix. And where do they source their heirloom, open-pollinated vegetable seeds? Not from Oregon’s lush Willamette Valley. They’ve come to put their trust in Johnny’s Selected Seeds and FEDCO, both of Maine (not far from Belgrade Lakes in fact), for the most reliable germination rates. Apparently, many seed companies sell home gardeners the dregs. Like me, many assume the fault is their own black thumb and not the seeds when they don’t sprout. Still, it was surprising to hear this Corvallis farm has to source its seeds (and many farm implements, such as soil-block maker, from as far away as Maine. Maine is where it’s at, I keep telling myself. And we’ll see the local food scene converge in full force, soon after we arrive, at the Common Ground Fair. It’s put on by what I believe is the oldest organic-farming association. Something nice to look forward to, to balance all the missing. And touring the farm today, I felt awash with gratitude for all that Oregon has taught this former fire escape-gardener about agriculture. In Baltimore, I grew herbs and maybe a cherry tomato in pots on my fire escape. Since moving to Oregon, I’ve grown lots of garlic and peas, rhubarb, fava beans, asparagus, carrots, potatoes, beets, tomatoes, blueberries, a few figs, most without great success since I’m bad about watering. And we’re often gone in summer (hence the desire to relocate back East). But today I knew how to recognize all the crops on this esteemed farm–the lace-y carrot tops, the feathery forests of asparagus, the buckwheat–because I’ve now tried (often in vain) to grow many of them. These struggles make you feel a sense of awe and connection to the work of these farmers. Get more views and traffic with paid distribution from PR Newswire. Find out more.